"A dark and moonless night away from all lights allowed a great view of this textured patch of airglow," says Whittaker. "The illumination was faint, but it could be seen especially in contrast to the dark ocean abyss below!" 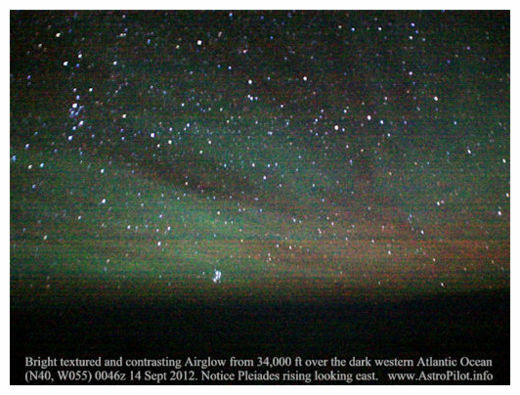 Although airglow resembles the aurora borealis, its underlying physics is different. Airglow is caused by an assortment of chemical reactions in the upper atmosphere. During the day, ultraviolet radiation from the sun ionizes atoms and breaks apart molecules. At night, the atoms and molecules recombine, emitting photons as they return to normal. This process produces an aurora-like glow visible on very dark nights. Because the Moon is new on Sept. 15th, tonight is a good night to spy this phenomenon. Get away from city lights, if you can, and take a look!